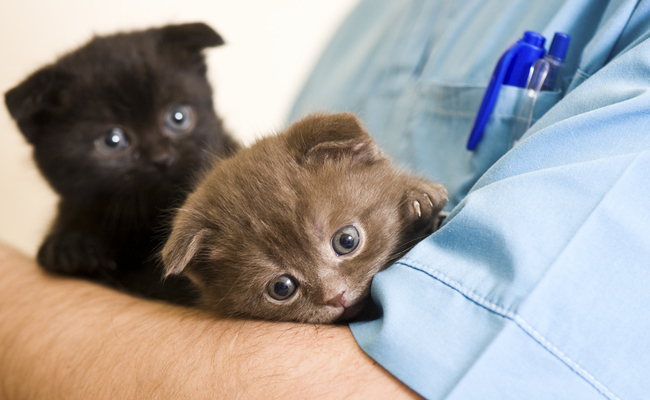 Care2 Healthy Living | Can You Harm Your Pet by Neutering/Spaying Too Young? World Spay Day falls on the last Tuesday in February every year. While spaying and neutering will help reduce the 2.7 million shelter pets killed every year, recent research shows that shelters and veterinarians often spay and neuter pets at such a young age that it can affect their lifespan, overall health and their behavior. For good reason, many shelters won’t adopt out pets until they are neutered or spayed, even if they are kittens and puppies eight-weeks-old who haven’t yet reached sexual maturity. That way, it’s a guarantee that their adopted animal won’t be contributing to the over-population crisis. However, after reading studies showing the effects of the long term skeletal, physical and behavior effect on dogs and cats desexed at a premature age, it made me question whether I even made the best choices for my own dogs. Sanchez was neutered at 7 months of age, and Gina at 6 months (although I didn’t adopt her until she was over a year). A study published in the UN National Library of Medicine found dogs spayed and neutered at less than a year of age were significantly taller than those desexed after age 1. Furthermore, the bones of pups spayed and neutered before puberty continue to grow. Dogs spayed or neutered at a younger age often have longer limbs, lighter bone structure, narrower chests and narrower skulls. This results in altered body proportions of certain bones relative to others — but it isn’t just a cosmetic issue. This disproportion often results in increased stress on ligaments, which can later easily cause injury. Another study published in the UN National Library of Medicine found that dogs spayed or neutered before 5 1/2 months of age were much more likely to develop hip dysplasia than those spayed or neutered older than 5 1/2 months. Also, dogs spayed or neutered younger than 24 weeks were more likely to develop infectious diseases than dogs older than 24 weeks. As for female dogs, there has been an increase in urinary incontinence in those spayed too early. Another study published in the National Library of Medicine showed that dogs neutered before 5 1/2 months had an increased incidence of noise phobias and unwanted sexual behaviors. Also, recent research by the American Kennel Club Canine Health Foundation found that when females were spayed too young, they were more likely to develop fearful behaviors while their male counterparts were more likely to show aggression. Obviously, if you decide to delay your spay and neutering of your newly adopted pup or kitty, please be responsible if they have reached sexual maturity and are able to reproduce. Make sure they are under your control at all times and don’t breed. I am in huge support of not contributing to the pet over-population crisis. I’m just suggesting you do your research before you decide what age is best for your Buster or Kitty. I have never had doubts about this. They have reduced the age for the operation more and more. In males - I believe - it is particularly dangerous for much increased levels of urinary crystals. And no, Carole R, I wouldn't automatically trust your vet. I would never sterilise a male cat before at the very least the age of 6 months (but later it's better) and I would allow the females to have a heat (just to be on the safe side). It can be difficult for us (crying and so on) but if we love them we have to go through that. After the first heat then the operation - if done correctly - is ok. And yes, you need to look after them and not let them wander outside unsupervised. But this applies also to after sterilisation: their life is precious. I guess you just have to trust your vet.